You’ve probably never heard of Ric Weiland. That seems to be the way he wanted it. But he was one of the men who was there at the beginning of Microsoft, and his legacy through philanthropy to the gay rights movement is making itself heard. 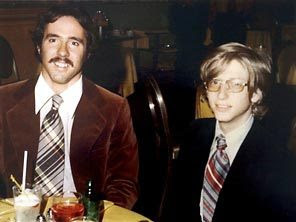 Weiland [pictured left with Bill Gates in 1976] has left $65 million to the Pride Foundation in Seattle and 10 nonprofit organizations, believed to be the largest estate gift ever given to the gay and lesbian community in the U.S.
His generosity didn’t stop there. Weiland left $160 million, the majority of his estate, to charity. That includes a gift to Stanford University estimated to be worth $60 million, which the university said is the largest bequest it has ever received. Weiland also gave significant amounts toward environmental protection and scientific research. Weiland, one of the first five Microsoft employees, committed suicide in 2006 at age 53. It has taken more than a year to sort out his estate, and the full scope of Weiland’s giving is now starting to emerge. The first disbursements began last summer and will be completed sometime this year. For the Pride Foundation, which has an annual budget of $2.5 million and endowment of $3 million, Weiland’s gift of more than $19 million will significantly expand its efforts throughout the Northwest. The money will support anti-discrimination campaigns and programs to help youths, develop future leaders and provide scholarships. Weiland was hardly a typical Microsoft millionaire. He shunned the spotlight, refusing to be singled out on donor-recognition lists. Friends say he wrestled with the burden of wealth that came almost by accident, and thought deeply about how to give his life meaning. Weiland, who suffered from chronic depression, found great solace in his philanthropic projects. News of Weiland’s bequest brought a sense of hope to people still coping with the tragedy of his death. His suicide shocked even his closest friends, who didn’t realize how ill Weiland had become. That was the nature of his private personality, Haberman said. “People knew him for years and years, but upon his death didn’t really know him very well,” she said. Ultimately, Weiland hoped his acts would inspire more people to give, even though the visibility of these last donations would have made him uneasy, Bailey said. “Each time he became more visible around his giving, I could tell he knew he was sacrificing something by doing that — the low profile that was so important to him,” he said.